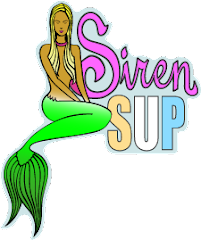 Kristy's Awesome Surf Adventures: Siren Surfboards NEW Stand Up Paddle Board! Siren Surfboards NEW Stand Up Paddle Board! New for 2009! Siren Surfboards unveils the newest addition to its awesome line of surfboards, The Stand Up Paddle model, or simply the SUP. The SUP currently comes in 2 different sizes, depending on the riders size and what type of paddling you plan to do, flat water or in the surf. 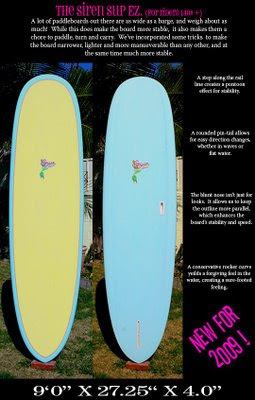 2 summers ago I tried Stand Up Paddling for the first time, although I was instantly captivated by this new form of surfing, the other thought that entered my mind was " I want to do this, but..... how in the world will I ever be able to tote around this 12 ft. board I am going to need!" Well, things have come along way in the sport in 2 years and the standard size of the boards have gotten shorter and a little less massive. I think 2009 however, will belong to the SUP by Siren. All you ladies out there listen up, you must try this board! The SUP EZ2 is the perfect sized board for flat water paddling and if you are looking for a real cruiser. The extra round nose and touch of extra thickness make this the perfect beginner board as well. All the stability you need in a under 10 ft, totally manageable, take off the car by yourself, walk 2 blocks to the water without giving yourself permanent neck injury package. The other size Siren offers, simply the EZ, is perfect for those paddlers that weigh up to 140 lbs. or the more experienced paddler. This board is a blast in the surf, it nose rides great and the rounded pin tail really lets you cut loose some awesome turns! Both size boards have a "pontoon" shaped bottom that adds lots of stability while at the same time increase the speed of paddling with less effort. Genius! So, all you ladies who have been wanting to try Stand Up Paddling but just could not imaging having to paddle, maneuver and carry those massive 12 ft. boards, the time is now, go out and get your hands on the Siren SUP! Siren will be holding Demos and Clinics through the summer at locations coast to coast. So stay tuned to www.sirensurf.com, www.ibschoolofsurf.com and my awesome blog kristysawesomesurfadventures.blogspot.com for the 411 on where and when! HELLO! Is this one perfect for me or no? I'm like a little kid waiting till Christmas! !